Have you been good superheroes this year? 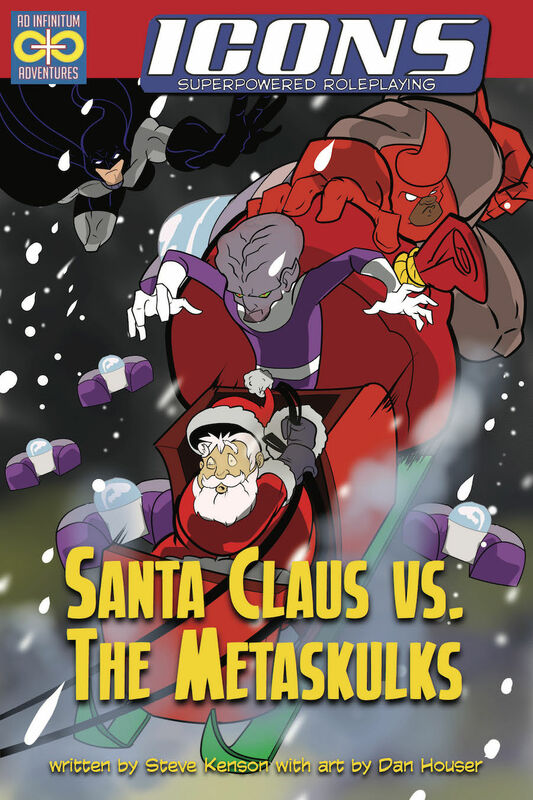 Certainly hope so, because you are going to meet the Jolly Ol’ Elf himself: Santa Claus, and have the opportunity to save him—and Christmastime—from the clutches of evil aliens in Santa Claus vs. the Metaskulks! This whimsical adventure for Icons Superpowered Roleplaying is just the sort of thing for a little holiday heroism with friends and family. In it, the heroes help to thwart a robbery during the holiday season, and discover there is a sinister alien influence at work, not just in the city, but the whole world! Available now on DriveThruRPG and RPGNow! This entry was posted in Publishing and tagged adventure, christmas, icons, santa. Bookmark the permalink. ← The Menace of the Man O’ Lantern!